If you’re travelling in January, try to make time for some of the fantastic festivals that are held all over the world every year. For example, if your travels take you to sunny Australia, stop by the Country Music Festival in Tamworth. In Scotland, Lerwick is host to the vikings-and-fire mischief that is Up Helly Aa! As a visitor, you'd probably not get into the all-night celebrations after the parade, but the Viking Squad's display is really quite impressive. 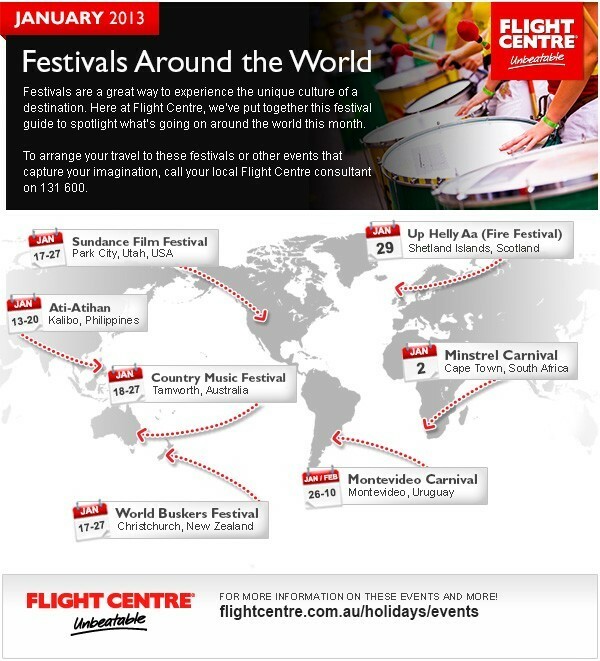 In the United States, there's the annual Sundance Film Festival, Kalibo in the Philippines offers up Ati-Atihan, Capetown is home to the Minstrel Carnival, New Zealand hosts the World Buskers Festival in Christchurch, and off-the-beaten-track Uruguay rounds things up with Montevideo Carnival. Last updated by jack on 03 February, 2014 in Travel.